Secrets of a university tutor: dissection of a reaction mechanism. Secrets of a university tutor: dissection of a reaction mechanism. Part 2, the stereochemistry. In the previous post, I went over how a reaction can be stripped down to basic components. That exercise was essentially a flat one in two dimensions, establishing only what connections between atoms are made or broken. Here we look at the three dimensional arrangements. It all boils down to identifying what the stereochemistry of the bonds marked with a wavy line are. To make it simple, let us start with the molecule shown on the left. The calculated transition state for the hydrogen shift is shown below. Click on the graphic to see a 3D model. You should notice how the hydrogen flies from the top face of the carbon (marked R below) to the top face of the accepting carbon. 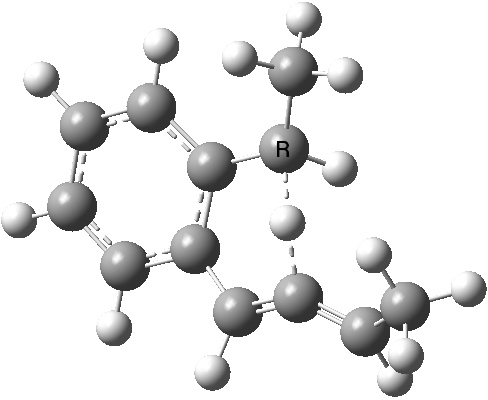 This is described as a suprafacial transfer, and it is the mode predicted by the pericyclic selection rule for a 4n+2 electron pericyclic reaction. A 1,5 hydrogen shift. Click for 3D. The energy profile for the reaction looks as below (ωB97XD/6-311G(d,p) calculation). It is a reaction that needs a fair bit of heating. Notice it is ~ 12 kcal/mol endothermic, and this is because the aromaticity of the benzo ring is destroyed in the resulting intermediate. You can also inspect the animation of the intrinsic reaction coordinate, as below. Note the relatively initial slow movement of the atoms, and how in contrast the hydrogen atom shoots over quite quickly. We can now repeat this for the four possible stereoisomers, as shown below. Another four appear possible in which the hydrogen migrates from the bottom face, but in fact these are identical to the first four. 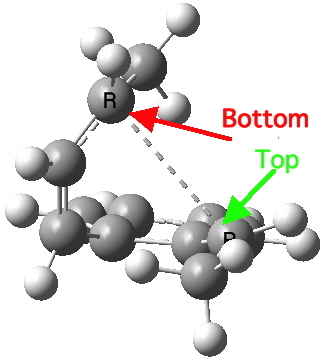 Of these, the first (the one shown above) is the lowest in free energy, and this can largely be attributed not so much to pericyclic selection rules, but to the steric bulk of the two methyl groups and their propensity to avoid each other. Now to the second step. For this to happen, one of the chains has to rotate about the bond shown above, this being a low energy process and this now sets up the formation of the C-C bond between the termini of the hexatriene. 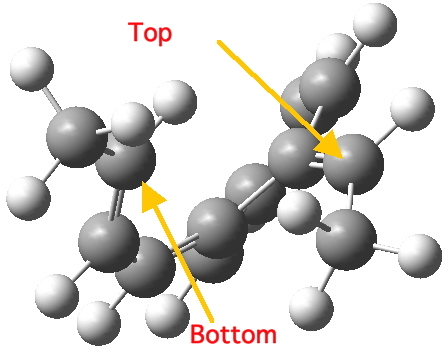 The barrier for forming this last bond is very small, since it is encouraged to do so by the re-formation of an aromatic ring. Notice also how the benzo group appears to re-aromatise before the C-C bond formation has progressed much. The final stereochemisty has both methyl groups pointing up because the forming C-C bond again does so suprafacially along the top face of the system. This again is as it should be for a 4n+2 electron pericyclic reaction. What about the alternatives, which are shown below. Notice how, as the two methyl groups are forced closer and closer together, the energy of this second step starts to go up. Take for example the second example in the series above. Notice how the initial geometry of the hexatriene adopts a helical shape to ensure that the methyl groups avoid each other, with the result that the two termini of the hexatriene present an antarafacial motif. As the reaction starts up, one end of the hexatriene starts up a rotation, and ends up presenting its other face, resulting in a suprafacial addition after pretending it might go antarafacial. The final fourth example is the oddest. The initial hexatriene geometry is again helical, to avoid the two methyl groups approaching each other too closely. Whereas before, the molecule had time to rearrange itself to present a suprafacial aspect to the forming bond, this time it does not. The transition state ends up forming the bond antarafacially after all, and of course, this is a forbidden 4n+2 thermal pericyclic reaction. The IRC shows the antarafacial component more clearly. There is a penalty to be paid; the energy now shoots up and is 20 kcal/mol higher than the first step. There is one other oddity. Normally in most pericyclic reactions where a C-C bond forms, its length is ~2.2Å at the transition state. Not so this particular example, where the length is closer to 3.2Å. Presumably, by making the reaction an early one, the molecule avoids the worst ravages of the 4n+2 antarafacially induced antiaromaticity. So to summarise, you can see by now that explaining the stereochemistry of a reaction necessitates looking at two aspects; the orbital controlled supra/antarafacial aspects, and the simple steric effects of two groups approaching too closely. This example nicely combines the aspects of stereo-electronic control and conformational analysis. This entry was posted on Monday, January 30th, 2012 at 2:46 pm and is filed under Uncategorized. You can follow any responses to this entry through the RSS 2.0 feed. You can leave a response, or trackback from your own site. Secrets of a university tutor: dissection of a reaction mechanism. Part 2, the stereochemistry. is licensed by Henry Rzepa under a Creative Commons Attribution-Noncommercial-Share Alike 3.0 United States License.